Blackjack Mentor is an instructional aide to help you become a better Blackjack player! If you want to win at Blackjack, you need to know the right action for each hand combination. Blackjack Mentor has three modes to make the process of learning the right plays fast, easy and fun. Interested in card counting? 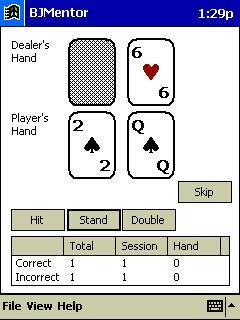 Then check out Blackjack Counter, also by DeepNet Technologies. It has every feature of Blackjack Mentor, plus outstanding card counting drills and features!